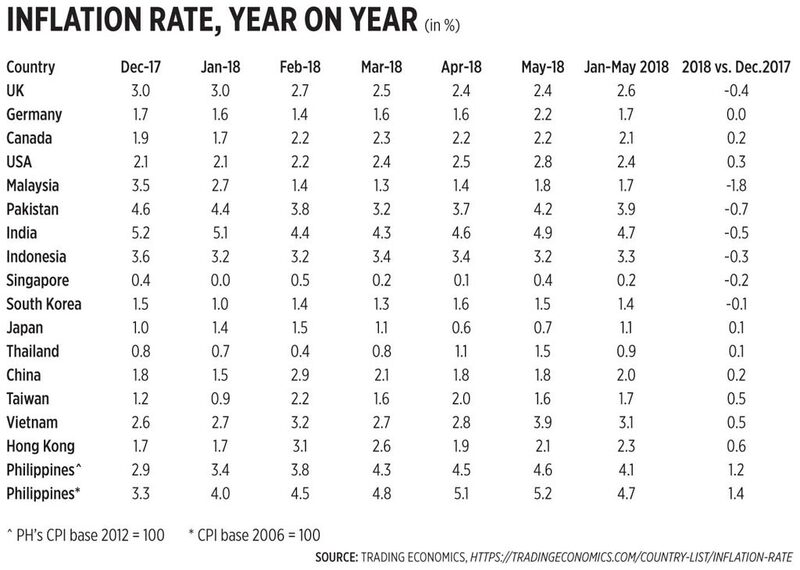 Fans, allies, and supporters of Dutertenomics continue to cite high world oil prices as the reason for the Philippines’ rising inflation rates. As expected, they maintain that tax hikes imposed by the newly implemented revenue legislation — Tax Reform for Acceleration and Inclusion (TRAIN) — have little impact on inflation. The numbers for many countries say otherwise. All countries were affected by high world oil prices but only a few of them have introduced higher taxes starting January 2018, unlike the Philippines. The result is indeed ugly for Dutertenomics to accept (see table). Even with these results, certain adjustments — if implemented — will have additional inflationary pressures. One, fare hikes on public land transportation such as jeepneys, taxi, ride-hailing vehicles, UV expresses, and buses. Owing to higher oil prices combined with increased taxes, several vehicle operators may be forced to cut costs elsewhere — buying cheaper spare parts, for instance — if they aren’t given the chance to raise fares, at least until end-2018. Two, wage hikes by many companies that are reeling from the uncertainties of TRAIN 2 on the removal of various fiscal incentives. Three, another round of oil/LPG/coal tax hikes by January 2019 or half-year away. One option that Dutertenomics and its allies has not seriously considered is the reduction of VAT from 12% — the highest in ASEAN, higher than those in Japan, South Korea, Taiwan, China, Australia — and reduce the number of exempted sectors. Prosperous Hong Kong has zero VAT or gross sales tax (GST); Malaysia has also abolished its 6% GST as a result of Mahathir’s campaign promise. 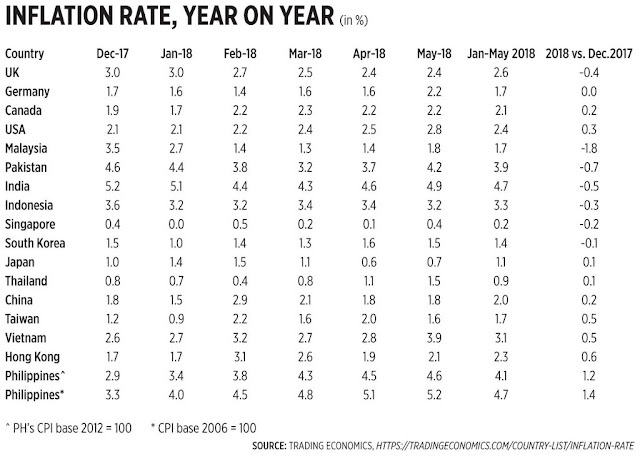 Cutting VAT from 12% to 8% (Taiwan has only 5%, Singapore has 7%, Japan has 8%) or even 10% will be a good anti-inflation policy. On the positive side, Dutertenomics is pushing for the abandonment of rice protectionism this year, liberalizing trade imports by converting quantitative restrictions into lower tariff, no cap or maximum on rice importation. They project that rice prices can go down up to P7/kilo and hence, food inflation will follow. This is a good move but pushed rather late instead of being legislated side by side with TRAIN 1. But it is better late than never. Besides rice, government should also consider freer trade in many other commodities — clothes, shoes, appliances, gadgets and consumer electronics, oil, etc. And we go to the subject of protectionism. To stop or reduce all those accusations of who’s protectionist, (1) everyone or all countries should go for zero or near-zero tariff, zero or near zero subsidy, and minimal non-tariff measures/barriers (NTM/NTBs). And (2) let this demand will come from us, consumers, not from Trump or any head of state or politician. Free trade, zero or near-zero tariff, is beautiful and is currently done by 10 member countries within the ASEAN, done by 28 member countries within the European Union (EU). Free trade means cheaper commodities — cheaper food and medicines, cheaper oil and gas, cheaper mobile phones and computers, cheaper cars and motorcycles, etc. — and low inflation (even deflation for some), more consumption of more goods by the people. On the global scene, here is one example. Tariff rates on imported cars are 25% in Canada, 10% in the EU, and 2.5% in the US. When Trump challenged equalized zero tariff for all, the others got angry. When Trump challenged equalized high tariff, the others remained angry. So one big problem is that while people enjoy more choices via free trade, they also produce all sorts of protectionist excuses why free trade cannot be done in their country then lambast some leaders and countries for being protectionist. Double talk and trade hypocrisy is very evident here. There are net gains (positives outweigh the negatives) from free trade and there are net pains from protectionism.